The drinking bird (also called a dippy bird or dunking bird) tilts up and down in response to the temperature difference between the top part and bottom part of the bird. The top and bottom parts of the bird consist of two glass bulbs. These two glass bulbs are joined with a glass tube. The top bulb is decorated to look like a bird's head. The head and beak is covered with felt-like material, and the remaining body is constructed as shown. The empty space inside the glass bulbs and glass tube has the air removed, and is filled with a special liquid (which is usually colored), typically dichloromethane. Inside the enclosed space, the liquid partially turns into a vapor and in doing so reaches an equilibrium pressure. This equilibrium pressure is interrupted during the operation of the drinking bird, as described below. 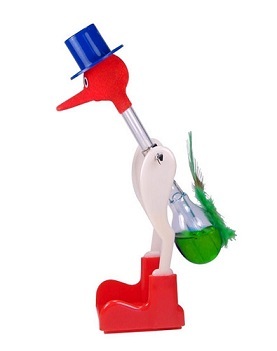 The drinking bird operates in a cycle. This cycle begins when the beak and head of the bird are wetted with water. The water evaporates and cools the top (head) bulb, by a process known as evaporative cooling. This causes the gas pressure inside the top bulb to decrease. The resulting pressure in the top bulb is lower than in the bottom bulb. This causes the liquid to rise up through the glass tube from the bottom bulb into the top bulb. This causes the bird to become top heavy, and the bird dips forward as a result. As the bird dips down far enough, some vapor bubbles travel through the glass tube from the bottom bulb and into the head bulb (due to the higher pressure in the bottom bulb). These vapor bubbles displace some of the liquid in the head bulb (and push it back down), which makes the head lighter and results in the bird becoming bottom heavy. This causes the bird to tilt back into the upright position. As the water on the bird's head continues to evaporate, the bird will once more dip forward, and the process continues. One can place a glass of water into which the bird's head dips, which keeps the beak and head constantly wet, and the process going. In doing this, we truly have a drinking bird. Since the operation of the drinking bird operates based on the head bulb being at a lower temperature than the bottom bulb, one can achieve the same effect by making the bottom bulb warmer than the top bulb, using a heat source of some kind. This will increase the pressure in the bottom bulb and the liquid will once again rise into the top bulb. The process will then be the same as before.